Lake Wanda under blue skies. Another beautiful day. 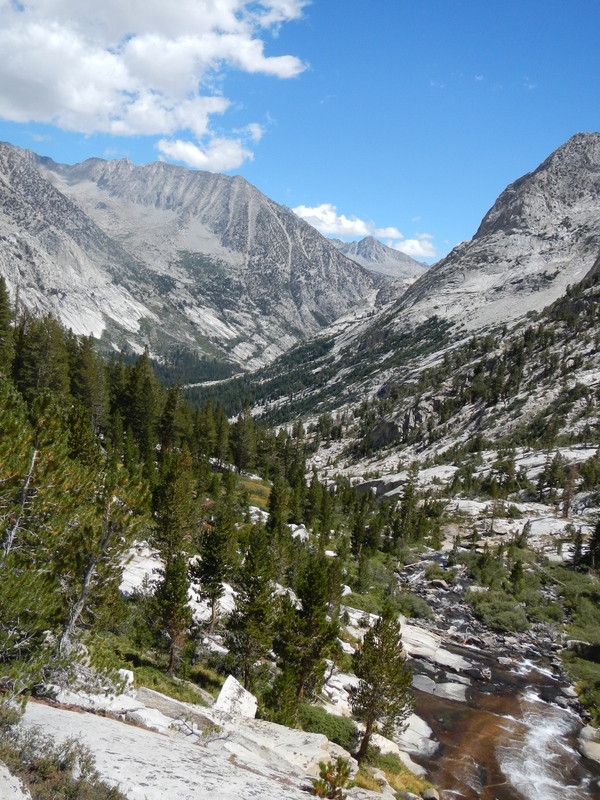 Started from Wanda Lake up to John Muir Pass. 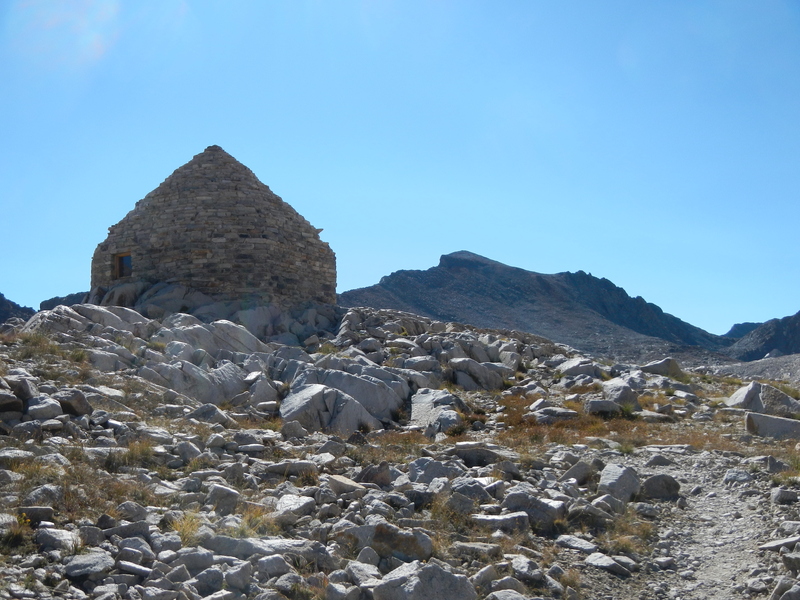 A steady but rocky ascent to the hut, where we ate snacks and admired the stonework of the hut. 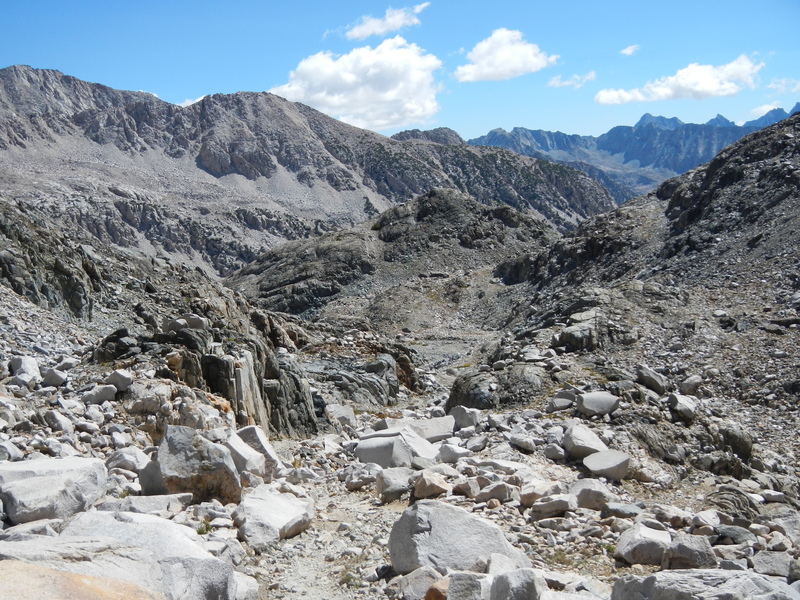 The pass is at 11,955′, the highest I’ve ever been, I think. 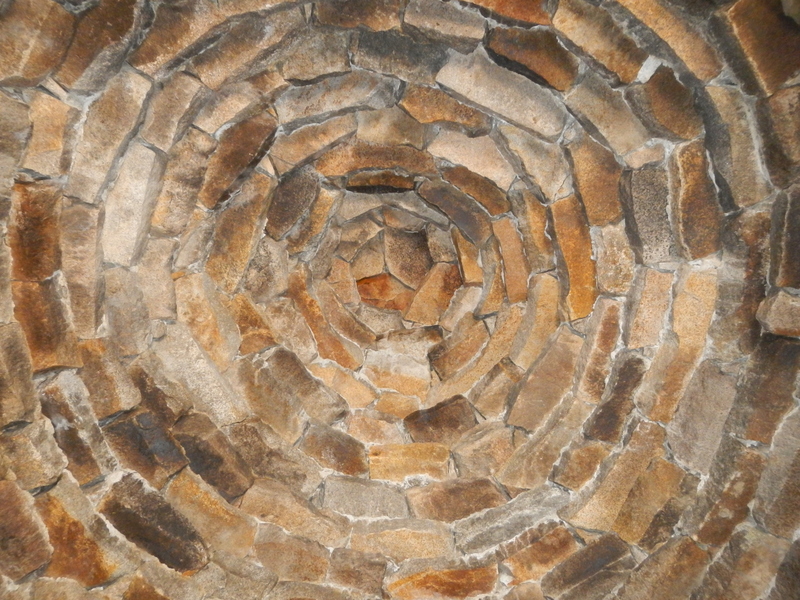 The ceiling of the hut is a beautiful dome! 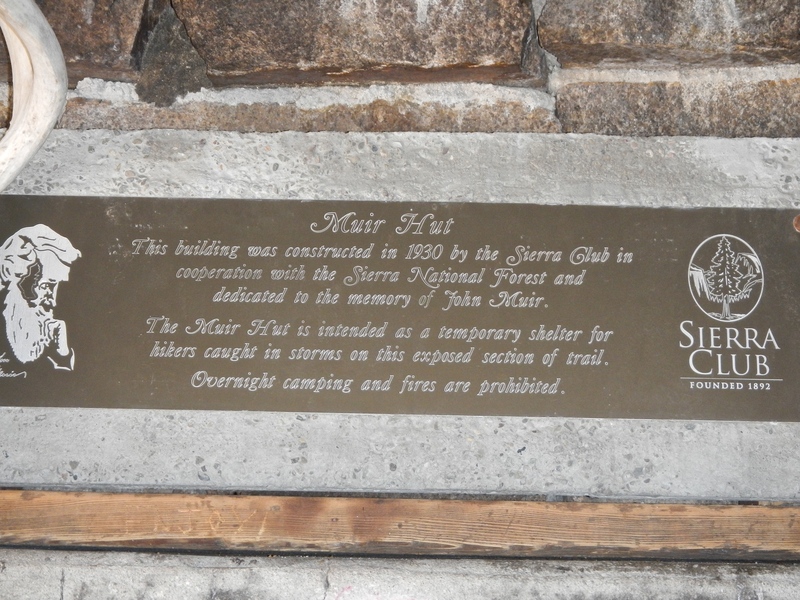 The plaque inside the John Muir hut, mounted above the fireplace, the use of which is prohibited. While we were resting and eating our snack, a ranger who looked like a superhero showed up. She had a slim waist and shapely legs with swelling calves, braids, a lovely face and broad shoulders. Maybe it’s being up here that does it. Maybe I’ll look like a superhero when we finish this hike… She was stationed for the summer at LeConte, but was on her way to McClure Meadow for some reason or other. Said to check out the yellow-legged mountain frogs in the lakes on the way south. They’re endangered, but plentiful in a few lakes near here. 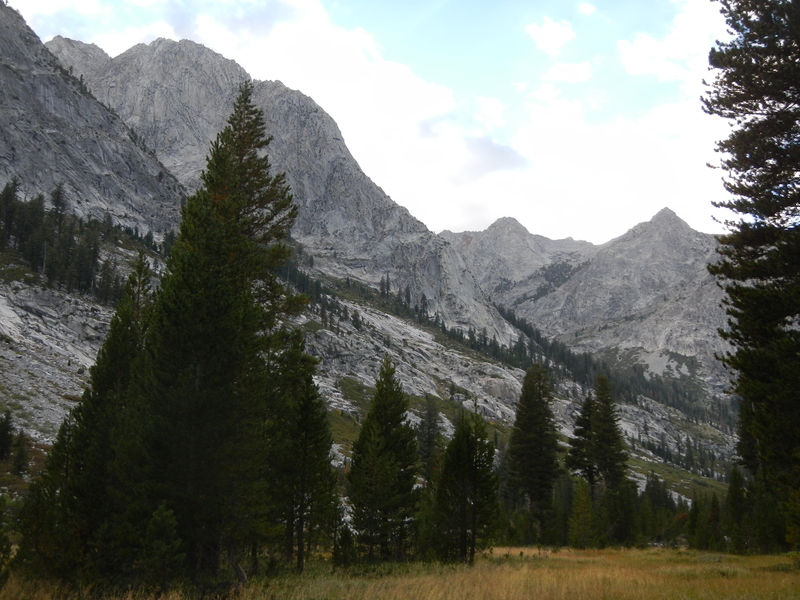 The rocky jumble of the Eastern Sierra. Extremely slow and slate-y descent. We had to watch every step more carefully than ever. 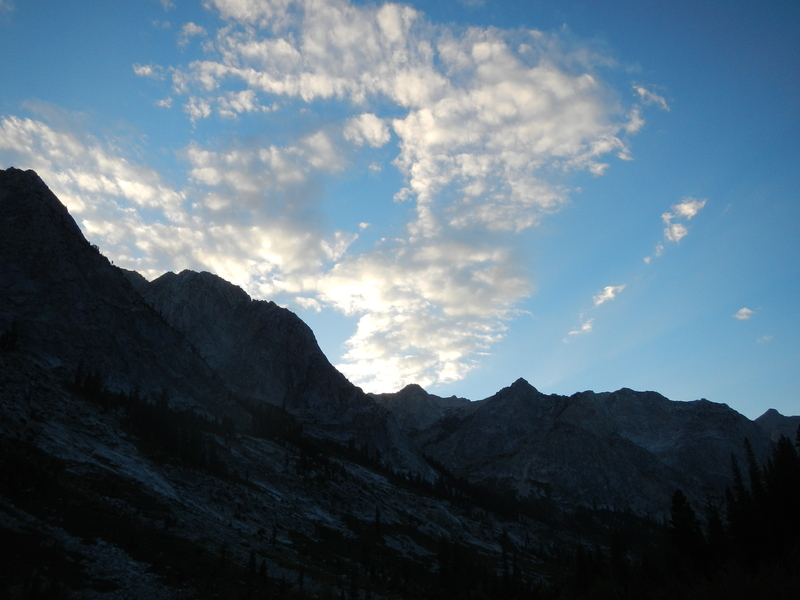 Very beautiful in the Eastern Sierra rubbly way. 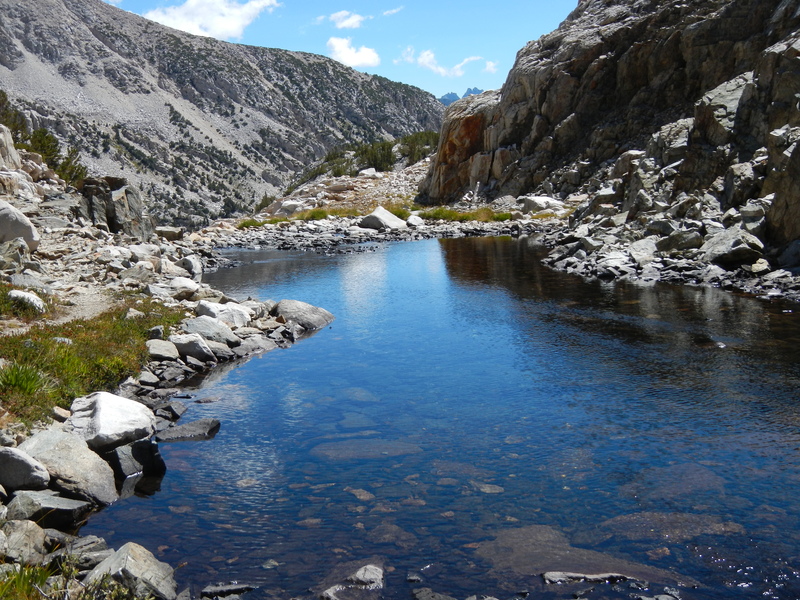 Watched a dipper along the headwaters of the Kings River. 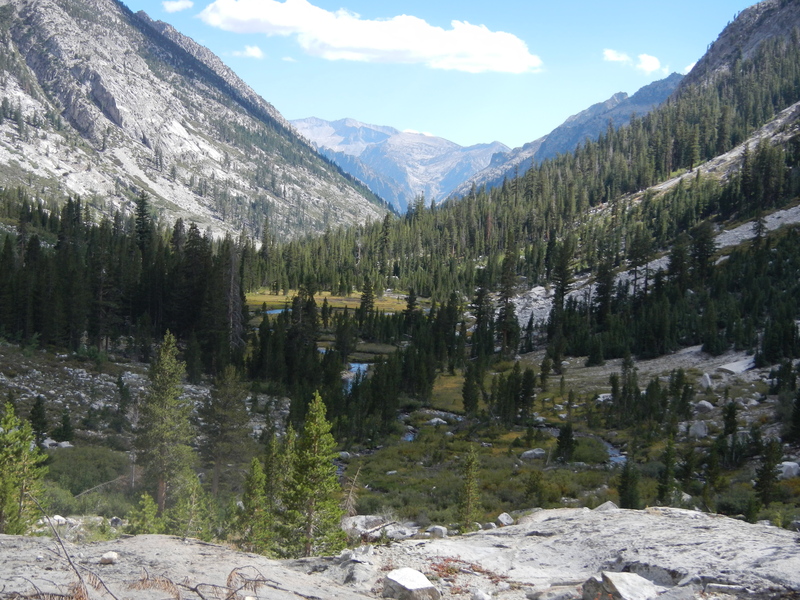 We have left the San Joaquin watershed behind, after walking through it for the last 85 miles. The Kings River accompanied us the rest of the day. Yellow-legged mountain frogs were plentiful at the lake where we had lunch. 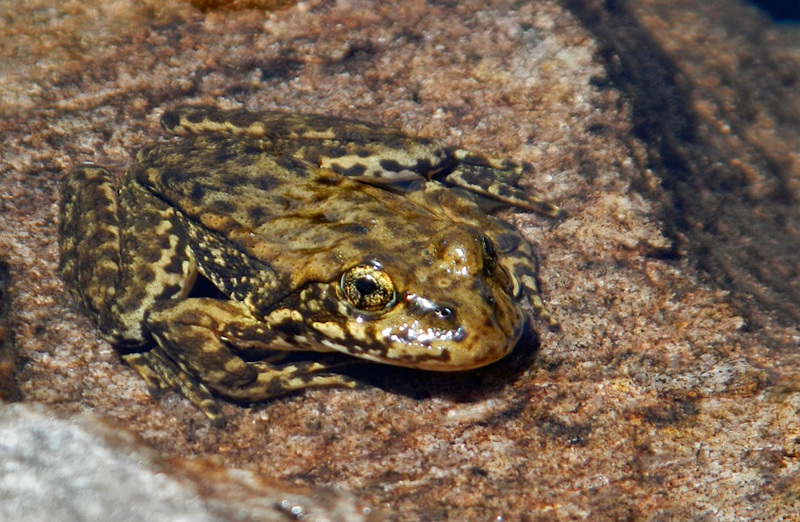 The yellow-legged frogs are on the endangered species list. 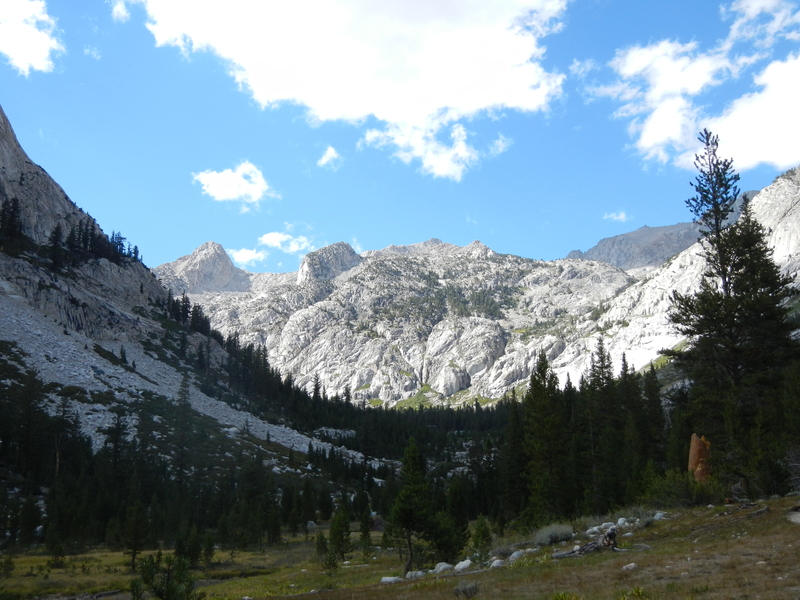 10 miles later we got to Grouse Meadow, at 8,200′, where we are now. The ranger had suggested that we stop there rather than at LeConte or a little farther down the trail, because to her eyes it’s much more lovely. And it is gorgeous! I’m fried. Tomorrow will be a long uphill, up the dreaded Golden Staircase. I need to rinse out clothes, but it seems too late to get them dry by morning. Guess we’ll have to be dirty. At least, I can rinse the dust off of my feet and legs with my pack towel and water from my water bottle. Looking down the valley we get to follow. How could you not want to go there? 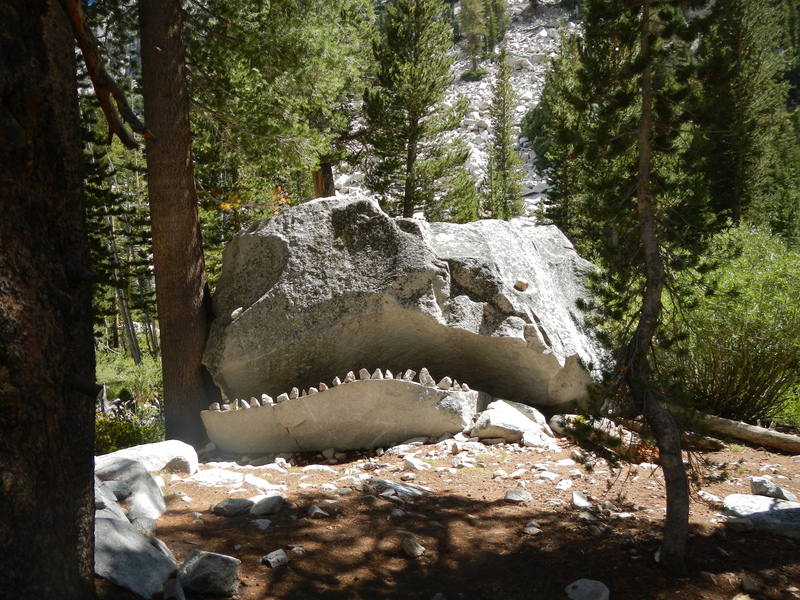 It’s customary for hikers to crawl into the jaws of this rock to have their pictures taken. Neither Betty nor I did, and now I wish I had. The grass was sparkling with white flowers. This is the day things start to break. I can feel that my shoes are more slippery. Much tread is gone. Betty’s tent needs a small but important repair: one of the cups that the pole goes through has a hole in it. The thick foam pad at the back of my pack has started to bend, creating an annoying bump against my back. So I pulled it out and cut it off, leaving only the lowest part along my hips. Hope it works out OK. Now I have a useless piece of foam that I have to carry. Also, duct tape doesn’t seem to stick to anything the way it does in Berkeley. And something is making me sneeze. Dust, no doubt. Almost 8:00 PM. Time for bed. 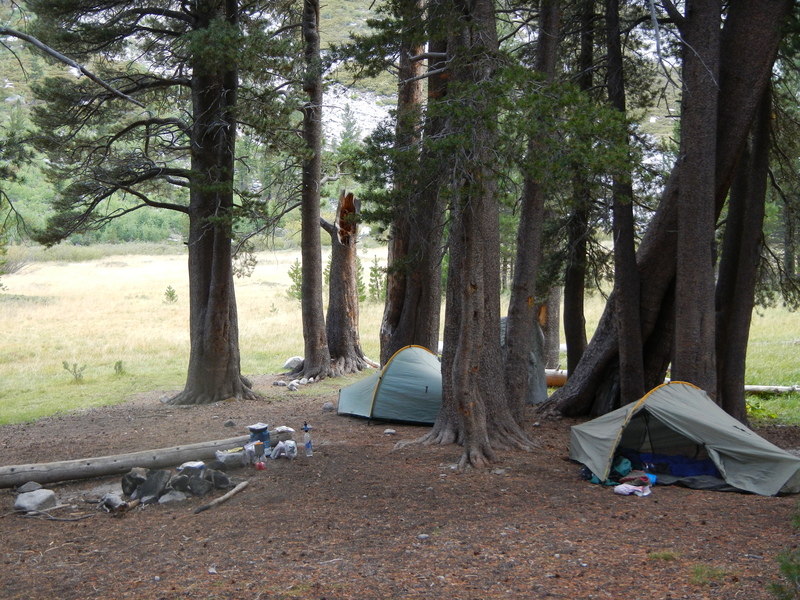 Getting close to Grouse Meadows and our camp for the night. Evening descends, and it’s time for bed. 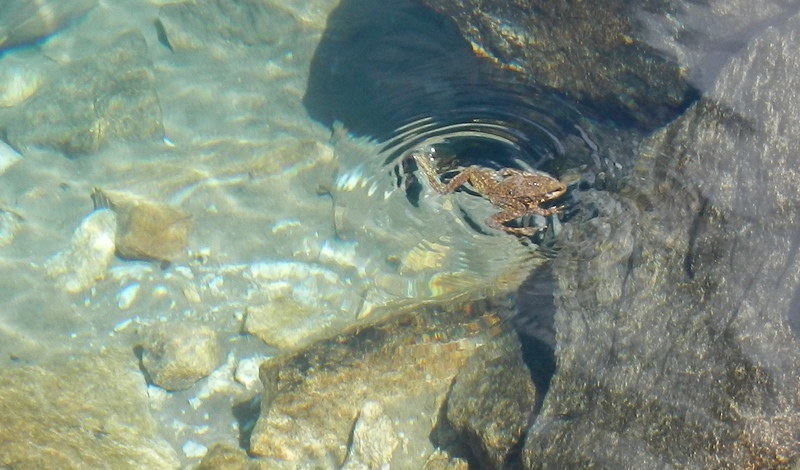 Im glad you were able to see the yellow legged frog like we did in Desolation Valley last month. They live in such pristine conditions! Seeya next week i have a copy of FedUp if your interested in watching it. I’m very glad I opened your blog/email first today instead of saving it for a treat after reading all the boring email. 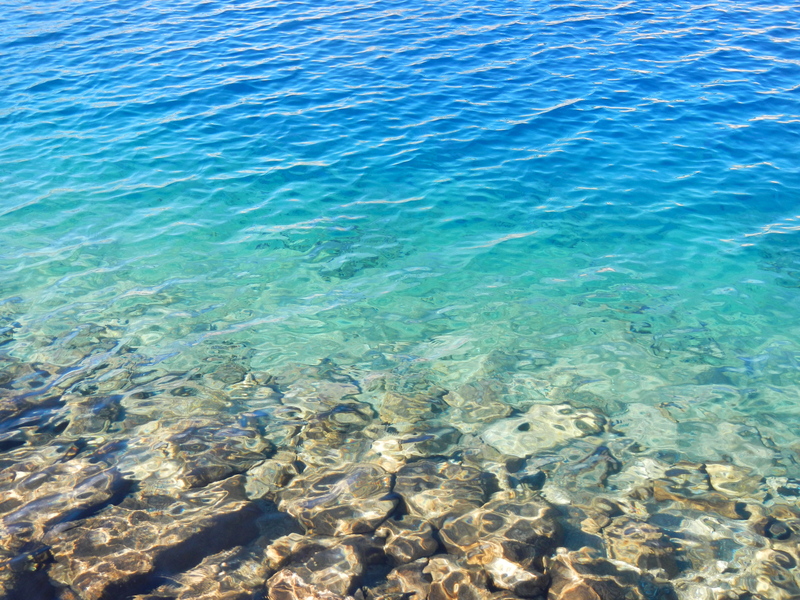 Seeing your photo of that beautiful Wanda Lake water was the perfect way to begin the day! (P.S. — I already firmly believe that you are Wonder Woman. I became convinced of this at a Tom Paxton concert at the Freight a few years ago when you seemingly flew down from the back of the house and leapt onto the stage in about 2 seconds after he asked you up to sing. I have no idea what Wonder Woman’s super powers really are, but surely leaping rapidly onto stages from great distances should qualify!). I’ve not been commenting but am SOOOOOO loving these entries and photos. I look forward to them daily and wish I was on the trail. (Well, it feels like I am, minus the blisters, cold and sweat) It’s so beautiful and inspirational. Thank you for taking the time to share each day. More wonderful writing, Laurie, as colorful, descriptive and sharply focused as your photographs. 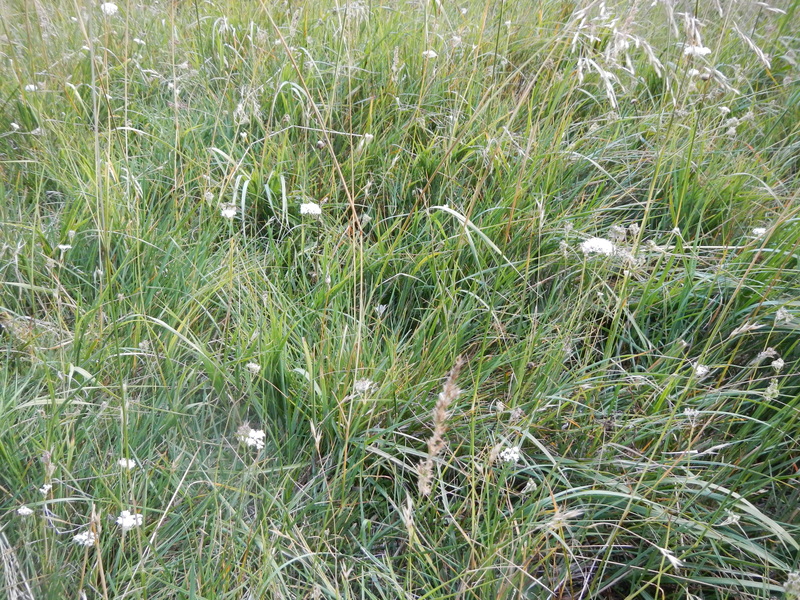 And that includes the photo captions: Yes, that meadow surely was “sparkling” with white flowers! 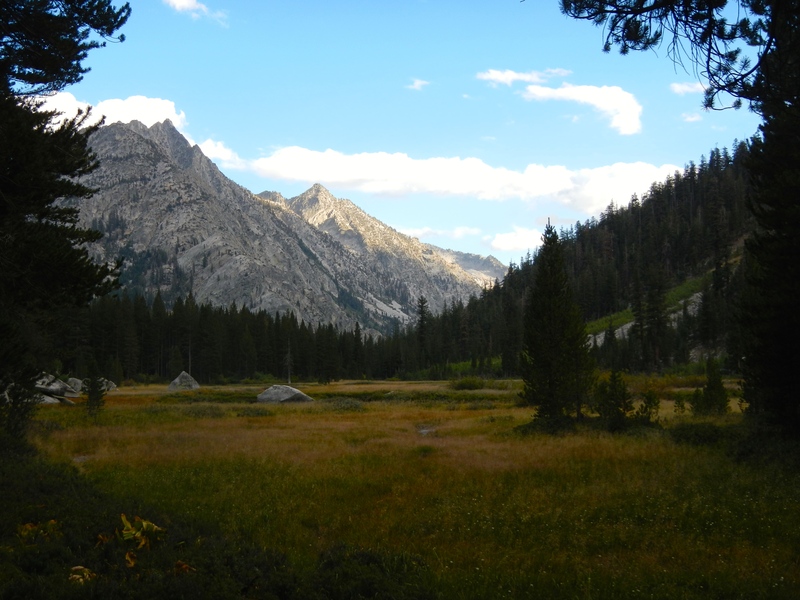 Continued thanks for sharing your Muir Trail odyssey in this series, so engaging and purely enjoyable.